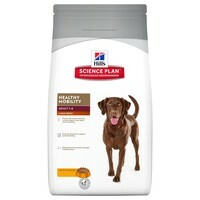 Hills Science Plan Healthy Mobility Large Adult Dog Food is specifically formulated to support active mobility and joint care in dogs. Enriched with omega-3 fatty acids and clinically proven antioxidants. It is a great choice for breeds that may be prone to joint stiffness or dogs that are getting older or starting to show slight signs of stiffness.